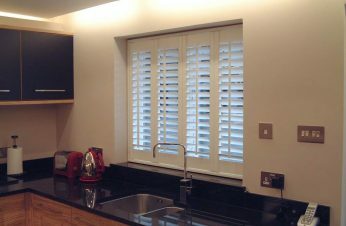 I’ve attached some photos of our shutters, which look amazing! Thank you both so much for all your help and advice along the way. You really were fantastic. 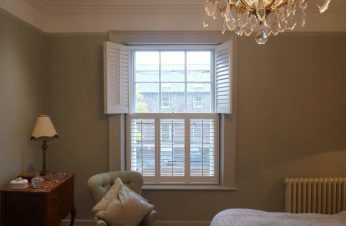 We are extremely pleased with our wooden shutters fitted to a Victorian sash window frame. The fitting was pretty straightforward and advice is always available from Gary and Sam. The shutters were very well packed and the information is available on YouTube. Fitting of the shutters was very simple especially using the D1 fixings, the shutters arrived on the Thursday and I fitted the bedroom shutter after work Thursday evening. The lounge shutter I fitted on the Friday. but because of the run on the bay ceiling I decided to lower the shutter and have a small shadow gap around the window sill as it was more level, then I fitted a small wooden trim like a pelmet around the ceiling just forward from the shutter. This still allows me to perform any adjustments should I ever need to, and covers the uneven gap between the shutter and ceiling. Despite the extra work I still had the job completed in a couple of days including painting of the additional pelmet. So a very successful job and we are very pleased with the result. 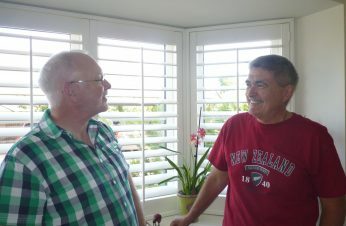 The shutters look good and operate very well. Many thanks for a great service. I’m pleased to say, I’m certain I made the right choice in using your company. As you’re doubtless aware there are many companies online providing a DIY option. However, following a lot of research, Opennshut were miles above the competition in terms of helpful, easy to understand resources. The information for measuring bay windows was particularly helpful. The concealed fixing system is great. I must admit I was a little sceptical that it would work properly. However, they work fantastic and are secure and robust, but also very easy to install. Compared to traditional fixings, particularly for a novice DIYer its a must have. 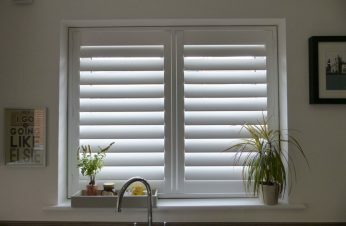 They not only make the installation quicker and cleaner but there is much less chance of pulling the frame out of square, and therefore less alignment/fitting issues when it comes to fitting the shutters themselves. Inexperienced DIYer’s could install shutters if they used these fixings and followed the information available on the website. I couldn’t say that about any other company out there catering for the DIY market. Well done Sam. Would definitely recommend the DIY shutter system to friends and family. 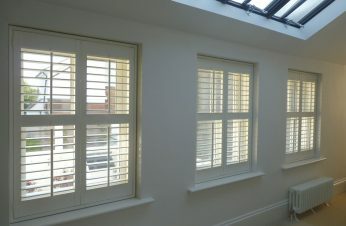 We are truly pleased with the end product, all the shutters look really great. 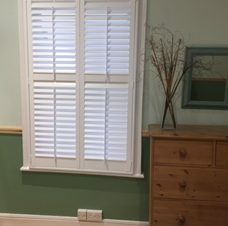 Just wanted to say many thanks indeed – the shutters are absolutely gorgeous – have definitely given the place the look I wanted – just love them ! You have been the best company I have ever dealt with. I have never had to chase you and delivered exactly as you said you would on time and a really great job. 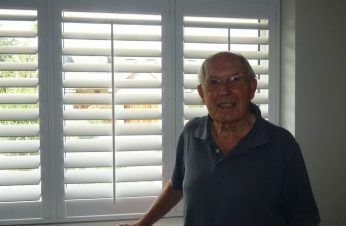 We are absolutely delighted and will highly recommend you to anyone mentioning shutters to me. 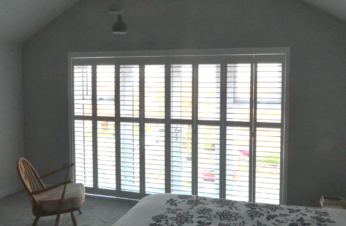 We are delighted with our brand new shutters installed in both our master bedroom and living room bay windows. They have transformed both rooms making them brighter and seemingly bigger, adding a contemporary modern feel and airy ambience. Sam and Gary worked neatly and efficiently with minimal disruption and left the house in a very tidy state. We would thoroughly recommend the polite and friendly service as well as the high quality of their products. Very pleasant dealing with you from start to finish. 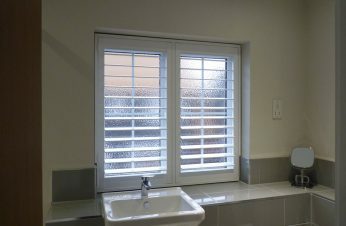 Expert advice on styles of shutter and specialist types for the bathroom and kitchen. You took so much care on measuring up and talking everything through, and the end result is lovely. The bathroom is my favourite – transformed the room. Amazing job, and wouldn’t hesitate to recommend you. Thanks. 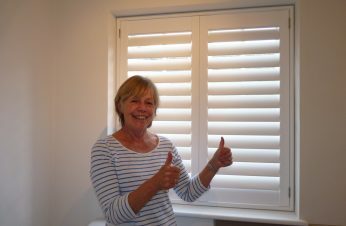 First saw your shutters in Boxgrove village store and was very impressed. My bathroom shutters are fabulous and excellent quality. Many thanks for such a professional job. 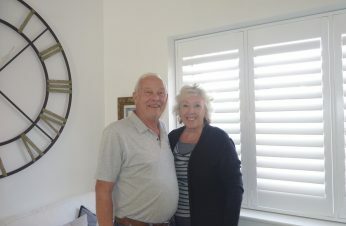 Thank you once again for a superb job, we are delighted with the shutters – they make such a difference, giving character and style to our ‘new build’ house. Sam is considerate, extremely professional and responsive to his clients’ requirements. 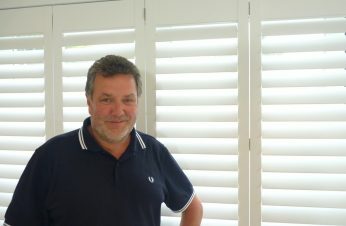 His meticulous attention to detail ensures a perfect fit and shutters that enhance the design of any interior. 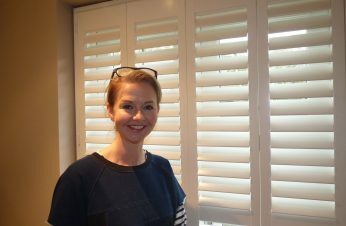 He installed shutters in our previous house and we are in no doubt that they made a huge contribution to the successful sale of that property. Having recently moved, we researched other national shutter companies but found Sam’s price very competitive. 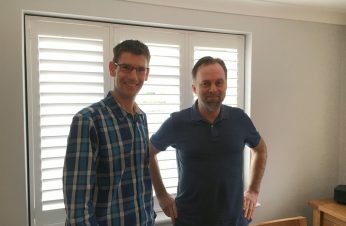 Sam and Gary did an excellent job making and fitting shutters to the specifications of our new home within a reasonable timescale. As well as being very nice chaps, they are polite, willing to offer advice, punctual and tidy. We had no hesitation welcoming them into our home and would highly recommend. Personal service throughout, quality of workmanship is first class, a great pride in their work shone through from start to finish – very tidy and accommodating. 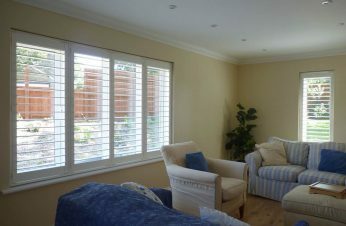 We now have a house that has been brought up to date with fantastic shutters. Highly recommend. 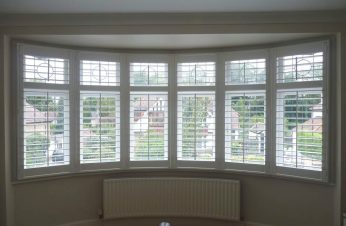 Plantation Shutters – 2 Bay and 1 Dorma Window to the front of the house. 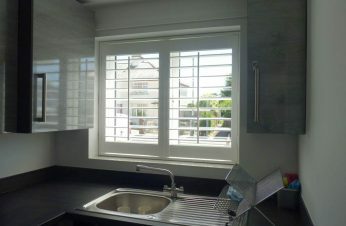 We are very happy with the shutters we have had fitted. The guys were very hard working and polite. 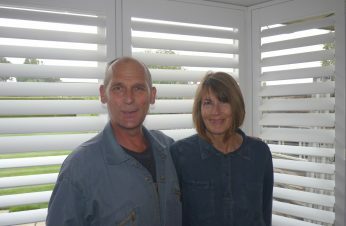 Just to say many thanks again for a very professional job – we are delighted with our new shutters. 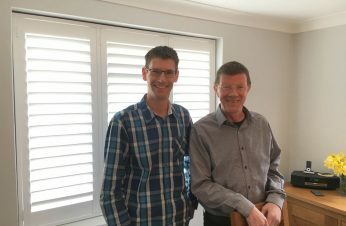 We were recommended to Chichester Shutters by the company that laid our wood flooring, and from our first meeting we found Sam to be professional, pleasant and knowledgable. We had a difficult bay window that we wanted to screen, along with other windows and roof lights, and he was able to offer solutions that met our needs. When we changed the kitchen and French doors, Sam was more than willing to remove shutters and refit with minimal fuss and cost. 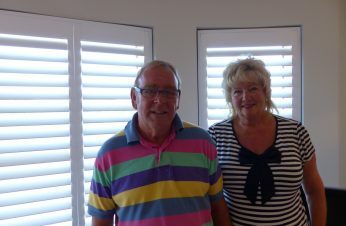 Six years on the shutters and blinds look as good as new and we have recommended him to neighbours and friends both for the quality of the products he installs and his clean and professional fitting. Thanks for making such a good professional job of fitting shutters in three of my rooms. I am really pleased with them. The work was carried out without any fuss, and was clean and tidy. 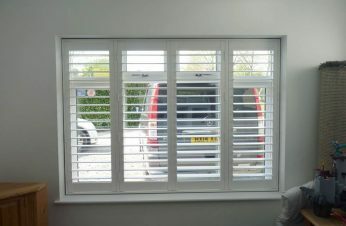 I was recommended to your company by two neighbours who also have had shutters supplied and fitted. If only all home improvement projects were as straightforward as this! After visits by longwinded salesmen from national companies, and quotes ranging from the sublime to the ridiculous, I went back on line to do yet more research and, thankfully, I found opennshut, a local company, recommended on a forum on Mumsnet. I was immediately impressed with the website and with Sam’s efficiency. There was no faffing around, Sam replied to my initial email immediately with prices and phoned the same afternoon to explain the various shutter options. The visit to measure the windows was conducted in the same professional manner. 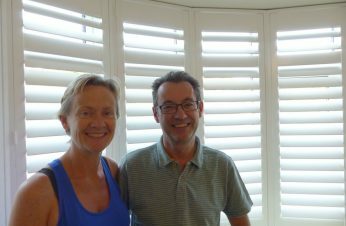 Sam arrived laden with samples and electronic measuring equipment – and completed the survey in an impressively thorough and meticulous manner – with the end result that the shutters fit perfectly. The fitting itself, by Sam and Gary, was completed quickly and efficiently with no fuss or mess. 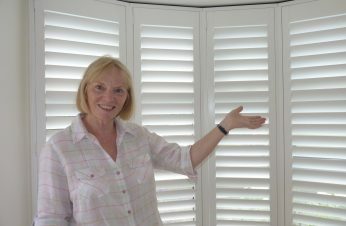 I’m absolutely delighted with my shutters – they are the perfect solution for me in terms of form and function. The split hidden tilt bars give the shuttered bay a very attractive, clean and uncluttered look. As the bay window is near the pavement, the split in the tilt bars allows me have light, but not at the expense of privacy. 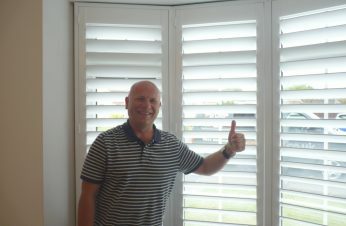 The shutters have attracted very positive and complimentary comments. The whole process with Sam and Opennshut has been a total breath of fresh air – straightforward, efficient and problem-free. Sam is a very personable, polite, well presented and knowledgeable individual and it has been a pleasure to deal with such a professional company. 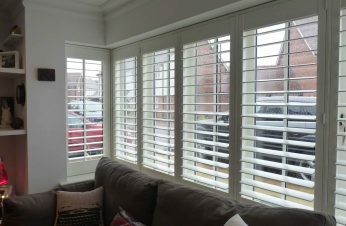 Very professional job and the shutters look great. Have already recommended you to friends who are looking for a stylish, modern and clean finish for their windows! 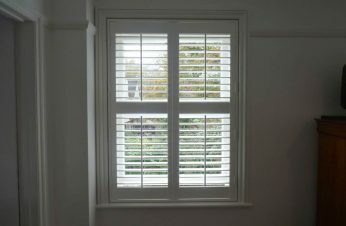 Having never had shutters before, we had a number of companies visit to quote. Sam really got to know our tastes and whilst we had some views, his recommendations were the ones we went with for the whole house. Coupled with his prices being commercially competitive, we chose Sam and have found the whole experience to be a good one. 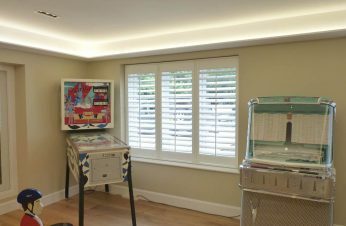 Throughout the process, Sam has been thoroughly professional, has completed the works when he said, and the quality of installation is exceptional. If like us, it is a leap of faith with shutters, we would have no reservations in recommending Sam. 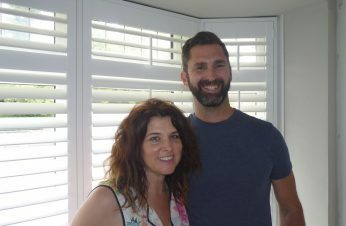 I spent a couple of days in Chichester with Sam Dunster and was very impressed with his obvious passion for shutters and his in-depth knowledge of the fitting process, there’s not much he doesn’t know about shutters! 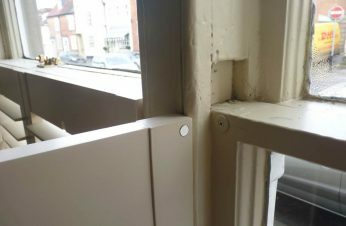 He has his own way of working which is very precise and uses the shadow gap fitting technique which allows for any distortions in the window recess and gives a much neater look to the finished job. 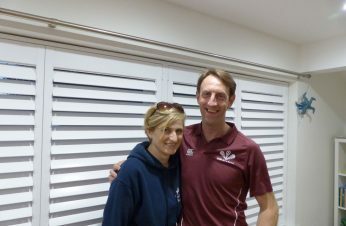 I’d highly recommend Sam Dunster as a teacher and someone who knows all about the fitting of window shutters. 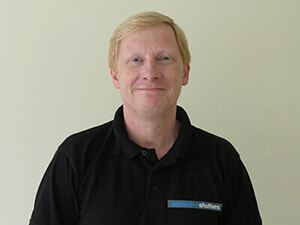 Colin Cornwall Edinburgh Shutters Ltd.
As a novice measuring and fitting shutters, the introduction Sam and his team gave me was invaluable and as put my mind at ease, the training is ongoing and it is nice to know Sam is there for help and advice in the future. 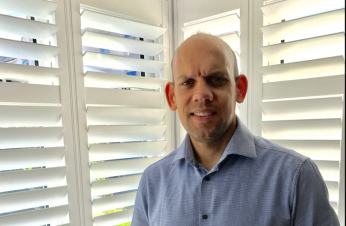 I wanted to start my own business supplying and fitting plantation shutters, as I was already trained and working for poor rates with a national company that was organised chaos at best. 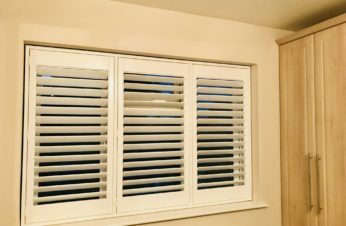 A chance enquiry with Opennshut, primarily to only supply shutters, lead to much communication from the ever helpful and friendly Sam Dunster. 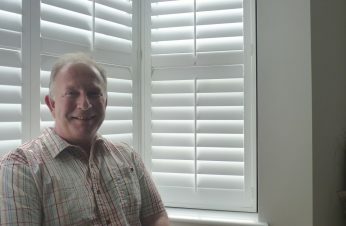 It has only taken a short while for me to get to grips with all things shutters, that was until now not offered by the national companies, so I have had much to learn, especially with their brilliant hidden fix system. The best thing about dealing with Opennshut is I never really feel I am out on my own, although I am running my own business. They are always a phone call away for help and advice. It’s wonderful to have another set of eyes watching your back! Gary Fisher is the logistics genie and all deliveries have been smooth to date. The great thing about Sam & Gary is that they are accomplished installers themselves with helpful advice that greatly assists me being that ‘cut above’ other companies. Opennshut, with their 18 years of experience in the shutter business, have all the great ideas of how to run a successful profitable business. The marketing package they offer is the key as this could’ve been an expensive hole to fall into with a standard web design media company who know nothing about the niche shutter market. Its still early days yet but things are looking promising. Thanks Opennshut!